In any other country Port Stephens would be a national icon. But here in Australia, the gorgeous bay and its beaches with thousands of things to do fly relatively under the radar. Lucky you. Port Stephens is the goldilocks of holiday spots – nothing is too big, nothing is too small, it’s all just right. Dolphins, fishing, dolphins, the Stockton Sand Dunes, dolphins and Tomaree Headland. The area is by far one of the most naturally gifted and understated places for a summer holiday. 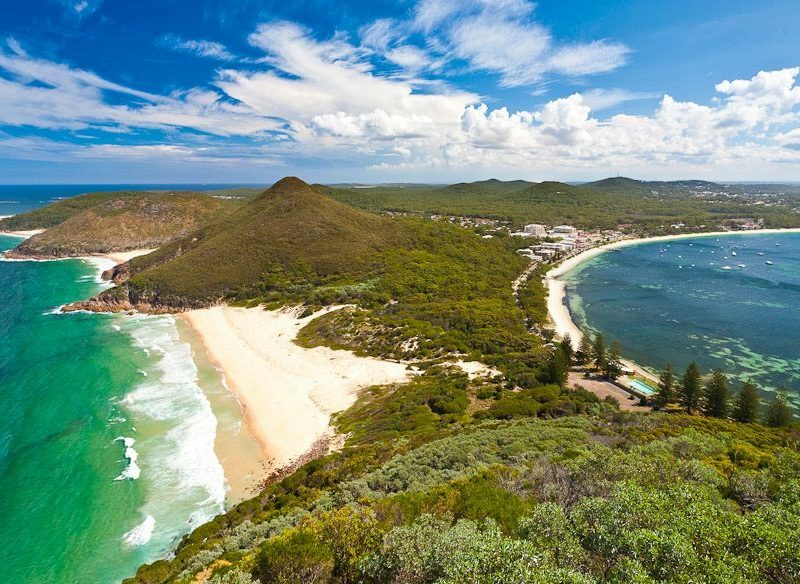 Half the other coastal destinations across Australia (and the world) envy the very natural talents of Port Stephens. Photos of the area are gorgeous, but just don’t do the place justice. This is a destination that over-delivers. Port Stephens is a very large area, more than double Sydney Harbour and therefore incorporates a huge range of landscapes and towns. Each town has a slightly different character despite almost all being on a series of consecutive bays. There is the somnambulist Tanilba Bay, elegant Soldiers Point, family-friendly Salamander Bay and upmarket Shoal Bay. The most well known is, of course, buzzy Nelson Bay, where the majority of shops and facilities are. Some intriguing tidbits: escaped convicts were found living with the local Worrimi People in 1795; North Arm was set to become a great city in 1918 when Walter Burley Griffin drew up a city plan for the town to become the main deep seaport of NSW; Tea Gardens was so named because Chinese immigrants tried growing tea there in about 1860. There’s no tea there now. Nelson Bay is 210 kilometres north of Sydney and about a three-hour drive. Most places around Port Stephens are about 10–20 minutes from Nelson Bay, except for Tea Gardens which is on the other side of the port. What’s there not to do? Beaches are seriously great and can have anyone from kidlets to nannas in raptures. For the former, the pick has to be genteel Shoal Bay, which has a fairly narrow stretch of sand – so it’s not a long walk to the water or car. The Humpback Highway is literally on the doorstep of Port Stephens. This year more than 25,000 are expected to pass by on their way to warmer waters north. For more wave-hungry beach bums, nothing beats Zenith Beach, the first of the three beautifully scythed stretches of sand south of Tomaree Head (the southern headland of the Port). All three are stunning and relatively underpopulated. As there are more than 200 dolphins in the port area, there is a lively trade in dolphin (and whale, when in season) watching tours. For a simple one-and-a-half hour mosey around with likely sightings, try Moonshadow Cruises. They also have a cool boom net and waterslide feature. The slide deposits riders onto a boom net that is lowered into the water so you get dragged along after a slide. Occasionally you can be lucky enough to have dolphins swim along with the boom net as well – pretty cool. But don’t opt for the lunch or dinner option; let’s just say the food is best left to the tourists. (Moonshadow Cruises Dolphin Cruise: Adult $20.80, Child $10.80 Family $65.50, 02 4984 9388, moonshadow.com.au). For a more energetic and closer view of the port (and hopefully dolphins), jump in a kayak. If you’re lucky, like we were, you’ll have a dolphin actually swim right up under your paddle. Barefoot beach beauty, Fingal Bay, Port Stephens. Fantastic snorkelling is found off Fly Point. Loads of fish, soft coral sponges and even turtles hang out in this marine life sanctuary. It’s dead easy to get to, too – park in the last spaces on Victoria Parade (the main road along the waterfront at Nelson Bay) past the turn off up to Shoal Bay. Then walk to the point and jump in. If the dolphins, fish and turtles are the most attractive things in the water, then the Stockton Sand Dunes are the most attractive thing above it. They are not only huge and majestic, but hugely fun. A three-hour zoom around on a quad bike is awesome. (Quad Bike King, 02 4919 0088, quadbikeking.com.au). Alternatively, a 90-minute 4WD tour of the dunes is a must. You’ll visit the wreck of the Sygna, which crash-landed in 1974 and was never able to be completely removed, so now sits corroding on the shore. You’ll also see the kooky ‘Tin City’ – a collection of 11 shacks originally built to house shipwrecked sailors, which are now slowly being covered by the dunes. And then for the real highlight – a good session of sand boarding. How the legs burn, getting back to the top of the dune. For more exhilaration (minus the thigh burn) try Toboggan Hill Park, a mini-mini theme park with an indoor climbing wall, maze and other little activities – along with tobogganing. Try not to get too frustrated by the confusing pricing: the entrance fee is $8 per adult, $5 per kid and then an additional spend per activity. Australian Shark and Ray Centre is another great one for getting young’uns out of the sun – kids get to play, feed and touch sharks and rays. Great fun for the under 10s. The eating options in Port Stephens punch way above the small population’s weight. The best local tip is Murray’s Craft Brewery. Easily overlooked because it’s blink-and-you’ll-miss-it on the road in from the highway, Murray’s offers a huge range of boutique beers – eight of which have been included in Australia’s Top 100. Bub’s Fish & Chips is another award-winning joint (although perhaps not the best in the state, as some have declared). Pick the sensible option and get your food to go – eating in offers views of the car park or an unattractive wharf. Dinners can be as cheap or expensive as you like. The options are plenty but stick to these winners as the failures can be, well disasters. For a great eat-in or take-out Thai you can’t beat Mod Thai in Nelson Bay. There are two Thai places on the same street – Mod Thai is in the same complex as the cinema. It’s classic Thai with some authenticity – simple, affordable, fresh and well done. A favourite is the Nam Prig Pow: chilli jam with mushrooms, capsicums and shallots. If you want to eat in, make a booking. Around the corner from our favourite Thai, Sandpipers on Magnus St do a more upmarket dinner and lunch. The menu is an interesting modern seafood Australian mix (plus a kids’ menu). The soft shell crab with a pineapple-and-mint salsa is worth a taste – a relaxed, unstuffy meal in a simple restaurant. The standout restaurant in the area has to be the hatted Zest Restaurant, less than a block from both Sandpipers and Mod Thai. Chef and owner Glen Thompson has created an institution of elegant food in a sophisticated restaurant. The menu is fairly European with meat and sauces dominating. It’s great food, and the staff are excellent. Our only disappointment was the wine list – it’s a little light, particularly on good bubbles by the glass. But we are being fussy. As you would expect in a seaside town, there are loads of cafes. Right next door to Sandpipers is Baroque. Great pastries and decent coffee, the service needs work but the fitout is great. Grand opulent chandeliers, black and white décor… it’s a Parisian riot in Nelson Bay. For a relaxed summer morning coffee, head to Shoal Bay Resort and the Sandyfoot Café & Bar. Simple café breakfast with a lovely view across the bay. Around the corner in a piazza between resort buildings, there are a couple more worthy cafes. The zany Gilligans bakery is decked out with Gilligan’s Island motifs and a TV that plays episodes all day, every day… And a menu of great classic café food. If there is one weakness in Port Stephens, it is the lack of a great bar. However, aside from Murray’s, our pick is Shoal Bay’s Sandyfoot Café & Bar. It’s a great spot to spend a sunset. The recently opened Shaol Bay Country Club is also one of the areas heroes. Peppers Anchorage: Right on the point at the Corlette between Salamander Bay and Nelson Bay, the resort has its own marina. The gardens are manicured, the bars and public spaces are like a private club and the rooms have sumptuous romantic views of the water, with the bush acting as a protective barrier from the world. Food is incredibly good and with decent spa facilities it is the quietest and most sophisticated resort in Port Stephens. Oaks Pacific Blue Salamander Bay: Ridiculously good value apartment resort in Salamander Bay. The big wow feature here is the lagoon pool, which circulates around the entire resort with apartments on either side. Most apartments have access to the pool from the room deck, so kids will be beside themselves with joy. Families (and gaggles of girls with plastic wine glasses and a floating ice bucket) spend much of the afternoon wandering around and around and around. Incredible value for multi-generational holidays or big family trips. Shoal Bay Resort Right on the beach, get a room with a fab view over the bay and you’ll be set for the entire holiday. You can spend the entire time not moving more than 50 metres; wandering from breakfast to the beach, to lunch, to the spa, to a snooze and back to the bar for a drink and dinner….. But back to you. It’s a great possie for families with the Kids Club kicking in on school holidays; circus classes, kids bingo, face painting – all the great stuff that let parents reintroduce themselves to each other. More active? Grab a bike and do some great rides to the surf beaches or do the Tomaree Headland walk. One downside is Shoal Bay was the first resort built in the area but the old girl still delivers. Jack’s Place Sometimes the best thing about a beach holiday is a beach shack and Jack’s Place is exactly that. Jack has given his shack a lick of paint, a tidy up, some of his favourite toys and nice landscaping.